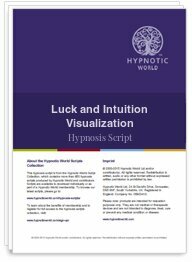 Develop the Mind Set to Attract Luck and Intuition into your life with this powerful hypnotic script. Do you (or your clients) feel as though certain individuals are just born lucky? No matter what happens to them they always seem to land on their feet and are offered the best opportunities in life whilst others have to fight hard to get what they want. Attracting good fortune and luck is not something that need only happen to others; being naturally lucky requires a certain frame of mind and an ability to trust and act upon your intuition. The adage you have to speculate to accumulate is so true, after all if you never do anything to alter your fortune how can you expect to be lucky? The mind-set of being lucky is no great secret but it does require a change of thinking and focus. Hypnosis, combined with the relaxation, guided imagery and positive suggestions in this program is the ideal tool to help you achieve this mind-set. When your clients open their mind to the infinite possibilities and potential that we all have within us then anything achievable is possible. Have you ever noticed how people with negative attitudes always seem to be unlucky? This isn't a co-incidence, neither is it a case of bad luck making those people feel negative - it is what is known as the Law of Attraction. We all possess unique characteristics. However, what we have in common is our personal inner belief system. Some call this their guardian angel or inner adviser - others think of it as intuition or wisdom but regardless of the name it is what shapes our life and the way we approach opportunities. This Luck and Intuition hypnosis session helps put your clients in touch with their centre core, helping them to believe in their ability to attract luck and trust in their intuition.